The New Zealand Dollar (NZD) plunged down against the US Dollar (USD) on Thursday, decreasing the price of NZDUSD to less than 0.6800 following some key economic releases. The technical bias shall remain bullish because of a higher high in the recent upside move. As of this writing, the pair is being traded around 0.6785. On the downside, a support can be noted around 0.6722, an immediate horizontal support ahead of 0.6664, the 38.2% Fib level support and then 0.6619, a key horizontal support as demonstrated in the given below chart. 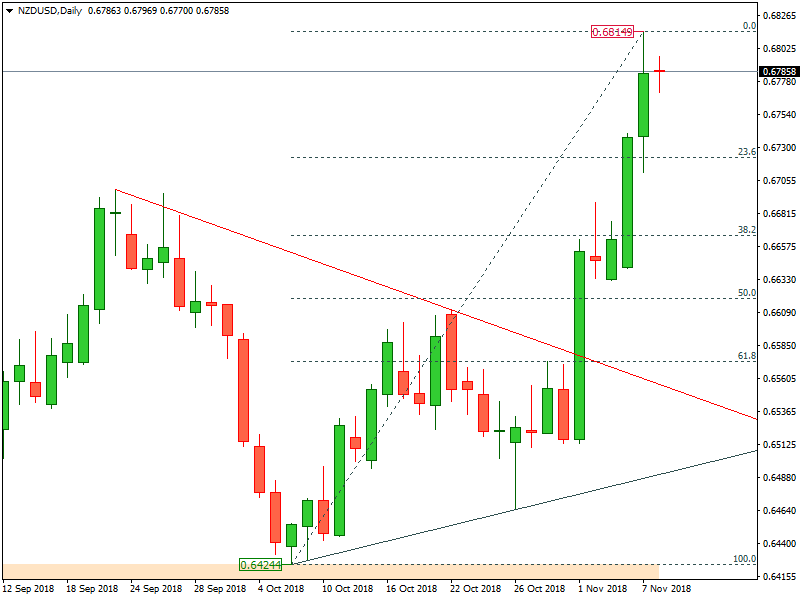 On the upside, a hurdle can be noted near 0.6930, a horizontal resistance level ahead of 0.7048, the 61.8% Fib level resistance and then 0.7432, the trendline resistance level as demonstrated in the given above chart. The technical bias shall remain bullish as long as the 0.6662 support area is intact. Initial claims for state unemployment benefits slipped 2K to a seasonally adjusted 210K for the week ended Aug. 18, the Labor Department said on Thursday. Economists polled by Reuters ahead of Thursday’s report had forecast claims rising to 215K in the latest week. Generally speaking, less number of claimants filing for unemployment allowance indicates a bullish trend for the US Dollar (USD) whereas increasing numbers of claimants imply a bearish market for the US Dollar (USD).